During the course of the year, students will engage in a variety of activities designed to increase their knowledge of video production. This class will ask students to express themselves through researching, writing and creating media projects. Hands-on, real-world activities will require students to be creative, responsible and professional. Students will consistently use critical thinking skills and a good work ethic to achieve an advanced level of media literacy. Video Production enhances the knowledge and skills taught in traditional English courses, focusing on those aspects of communication applicable to all types of video based media. The class will use CA visual art standards and CTE vocational standards. The objectives goals and standards will be posted on the board and the class website. Plan and create in-depth, research-based video projects. Edit, proofread and refine scripts. Create video projects with the elements of cinematography, graphics, multiple audio sources and voiceover narration. Analyze a variety of effective communication formats and use them as models for creating high impact videos. Tutor Intro level students when needed. Work independently and in small groups. Plan and carry out all phases of a video production project. Assume the role of producer, director, videographer and editor on video projects. Work with and frequently contact members of the community on a variety of video base projects. Do regular self-critiques of projects and share ideas for improvement with other members of the class. Investigate First Amendment issues and how they apply to industry and scholastic films and videos. Regularly use speaking and writing skills. 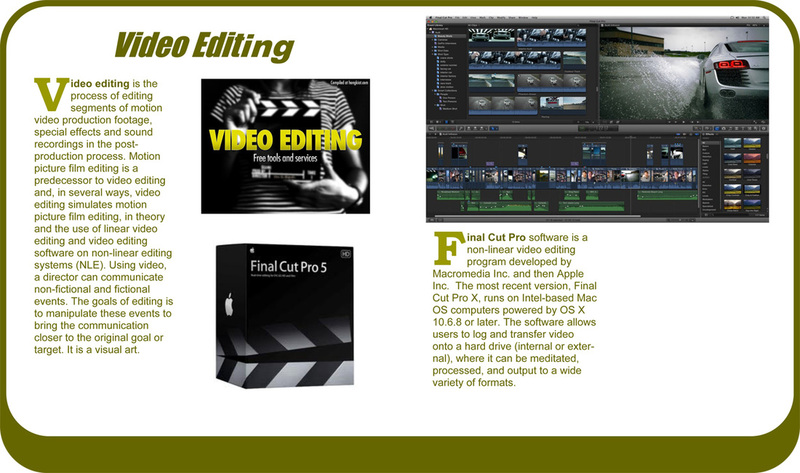 The Course Textbook for Video 1 is Video Production Handbook. Students are required to keep an ongoing notebook of reference material that will be distributed during the course. Media references and variety of on-line resources should be used as supplemental resources for the course. All equipment and supportive resources needed to complete assignments will be available to all students. It is not required that students have their own computer or video hardware at home in order to be successful in class. Students are encouraged to use their own cameras outside of school. A limited number of cameras are available for students to checkout. A parent/guardian equipment check-out form is required each time a student requests equipment for after-school loan. Grading is based on a point system. Points are assigned to video production class assignments, participation, homework, tests and quizzes. Total possible points available for an assignment are based on the complexity and depth of the work involved. Each project has a weighted list of required elements that are found on the assignment instructions. As grades are updated, the results are available to students and parents through Powerschool. 100 to 93% = A; 92 to 90 = A-; 89 to 88% = B+; 87 to 83= B; 82 to 80 = B-; 79 to 78% = C+; 77 to 73 = C; 72-70 = C-; 69 to 68% = D+; 67 to 63 = D; 62 to 60 = D-; 59 to 0 = F.
Quizzes are typically given once for each project. A final exam is given at the end of term based on all of the previous quizzes. Homework is light in this class; however, students are encouraged to shoot their video projects after-school. On a regular basis students should review their weekly quiz study notes. Several other homework assignments are given on an occasional basis. • Unexcused late work will receive at least one letter grade lower. Late homework assignments are accepted late for a limited time, after the stated final deadline, no points are available. • Incomplete work due to illness or other excused absence will receive a failing grade if not completed during an assigned period of time. • Students are expected to adhere to Leuzinger HS and MCA behavior expectations while both in the classroom or working on class projects outside of the classroom. • Students and parents are asked to sign a separate Student Responsibility Contract before students can proceed in using media communications equipment. • Classroom and individual behavioral expectations are outlined in the student handbook. The care and respect of individuals and class equipment are guiding principle for students in Media Communications. • Consequences for disregarding classroom or Leuzinger High School behavior expectations will be issued as soon as possible and will follow those consequences as outlined in the student handbook and/or those posted as part of the classroom rules. Repeated or serious violations of the rules can result in a loss of the privilege of using classroom equipment and computers. Alternative, pencil and paper-based assignments are given when this loss occurs. · Headphones. The small ear-bud style is best because they are less likely to break in a backpack. Students will use only one ear for sound and music editing. · A notebook or binder in which to keep a portfolio of course related reference material and production worksheets, along with pencils, pens, and binder paper. · Standard USB for storing image and word files. * Portable hard drive to take completed video files home. Please e-mail with any questions, thoughts or concerns at cire8888@yahoo.com.